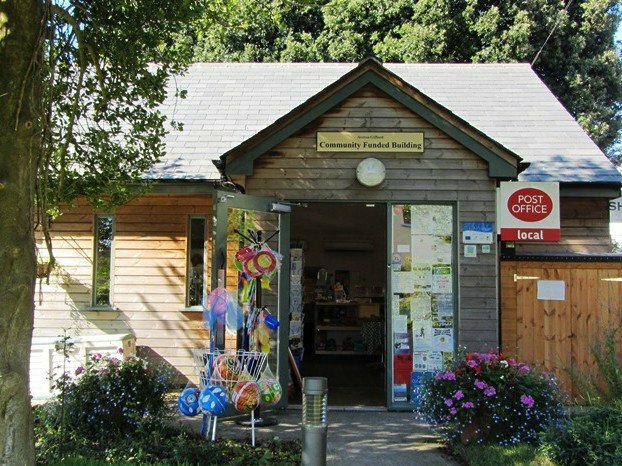 As a village shop and Post Office we aim to supply all the needs of the community on a day-to-day basis. Aveton Gifford Village Shop Association was formed when the last surviving shop in the village closed in 2003. Fundraising for the new community shop began and villagers bought shares priced at £5 each. The new shop premises, a purpose built timber-framed building that opened for business on the 1st August 2009, is a result of the hard work of committee members at the time, the shop staff, the villagers’ support for the scheme, and the current committee. NB – After a couple of attempted break-ins to the shop and the stock room behind, and an attempted fraudulent money scam, the interior and outside of the shop are both protected by CCTV. Aveton Gifford is a community owned shop. For the first 5 years it was run by Dinah Ashton and supported by Miriam and many other members of staff and volunteers. 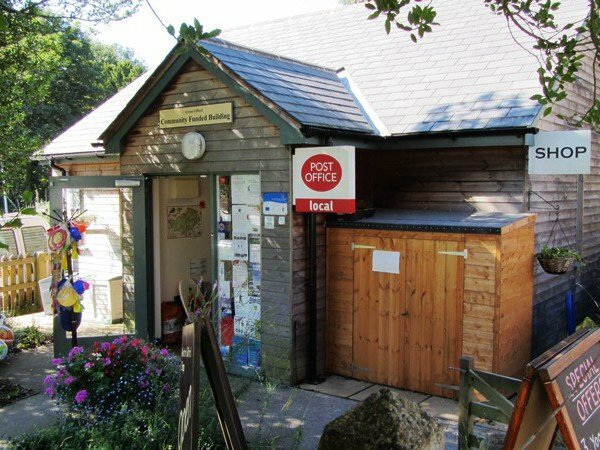 Over this time Dinah steadily increased the range of produce and upped the footfall, so that now we have a thriving shop in our village, with a busy Post Office counter. Dinah retired in 2018, and the shop has been taken over by Peta Harper. For various personal reasons many of the supporting staff have had to leave, and Peta has now the help of Katherine and volunteer help from shop committee members. Peta is still looking for an additional member of staff, so if you might be interested, please call into the shop and ask. The shop continues to thrive under Peta’s ownership. She has been approved by the Post Office, undergone rigorous training, and is now our official village Postmistress – the Post Office counter in the shop is now open every day in the week, and customers are able to withdraw cash, purchase Euros, pay in money or cheques, pay certain utility bills (if they are bar coded), send parcels every day of the week, and all the usual facilities of a local post office. Phone card top-ups, gift cards and electricity key top-ups can also be purchased here. Peta is now also training Katherine to work in the Post Office as well. Peta is now selling coffee or hot chocolate to take away or sit and enjoy here; a table and chairs is in the shop, or sit outside at the picnic table on sunny days! The shop sells locally produced products where possible and continually adds more. As well as the basics – milk, bread, eggs, meat and vegetables – we have a wide selection of other local food and treats as well (see the list below). The shop also supplies household goods, stationery, newspapers and much more. For eco-friendly shoppers, we have the Ecover range. We have a photocopying and laminating service as well – just call in and ask! We also sell maps including local walking maps and footpath guides, and local publications including “A Countryman’s Glimpse of the Twentieth Century”, “The Bombing of Aveton Gifford”, and “Aveton Gifford, A Heritage”. Several other books by local authors are also on sale here; “Grimoire, a Wayward Tale”, by TA Newman; “Paw Prints and Teeth – The Adventures of Charlie and Lottie” by Zoe Woodham and Jack Kirby; “Epitaph to Nickle Eck – Childhood Mischief in Wartime” by the late Eric Yates; and “The Great White Palace”, followed by “Whatever Next” , the second book of Tony Porter’s memoirs. A community Book Swap is also available at the shop. A large number of good books have been donated, and this has become increasingly popular, now requiring it’s own big bookcase by the door. We also have a Film Swap shelf – dvd’s of films suitable for all ages have been donated – come in and browse for something to while away an evening, or bring in films you’ve seen but others would enjoy. £1 will purchase a film, and the money goes to the shop maintenance fund. How about giving your kids something arty crafty to make and bring out their creative side? Adults love crafting so it’s not just for the kids! Come in and look at our kits and bring out the artist in you. You can order your newspapers and magazines here. 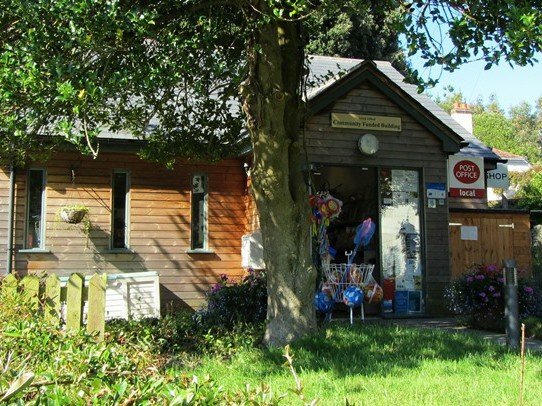 We have a genuine community shop here, run by Peta with Katherine, and further supported by a committee for some of the “official” aspects of the business and shop premises. Friends of the shop also help with other maintenance jobs to keep the shop and its garden in good order. However, money is always needed, not just for improvements, but also for ongoing maintenance and to replace old equipment; an old unreliable chiller cabinets was replaced in March 2015 with a donation from the parish council; a badly needed new till with an up to date software system has made stocktaking and administration much easier ; the new stock shed behind the shop was essential. The community has always stepped in to help, and the parish council has also given funds; in spring and summer months there is now a regular supply of plants and bulbs donated for sale by local people, and Yvonne Knapman has been knitting lots of gloves, hats and ear warmers during the winter. All of these have proved very popular, and raised a surprising amount of money for the Shop Fund. Likewise, DVD’s and CD’s have been donated; a huge range of films for all the family, from children’s Disney to horror movies; buy what you’d like for £1.00, and when you’ve seen it, bring it back, and it can be resold! Village calendars with local photos have been produced for several years to raise funds, and for several years (weather permitting!) Dinah has held Fun Dog Shows; all great ways to support the shop. 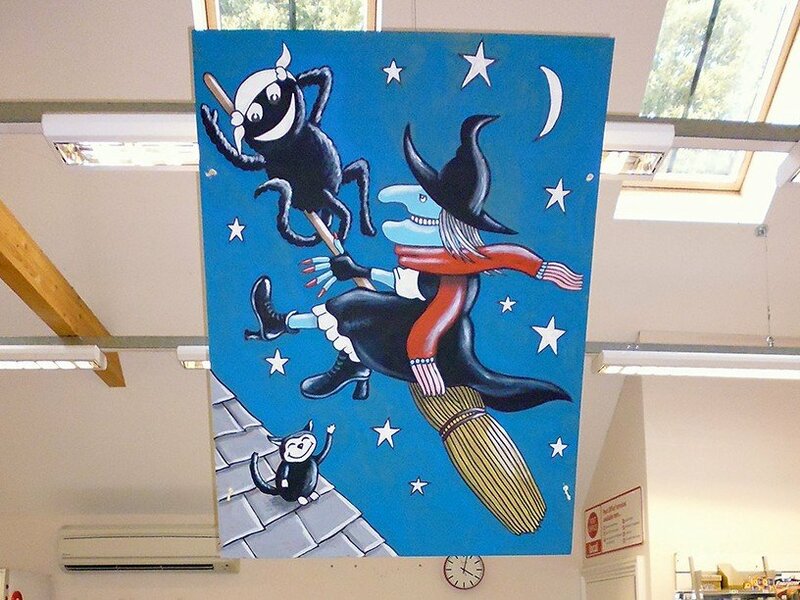 Any more ideas like this would be gratefully received! Seasonal vegetables and fruit supplied by local growers. We have strawberries in the summer, apples, courgettes and beans too, pumpkins in the autumn, sometimes damsons, crab apples. Our range varies with the seasons, and is still expanding ……. Challon’s Combe’s cows produce wonderful Organic Milk, Very Thick Double Cream and Yogurt. Halletts The Bakers bake a wide variety of delicious Breads and Cakes, including a NEW RANGE of gluten free products – They also bake wonderful treacle tarts, and various other delicious treats. If you would like to order bread, bread rolls, croissants or any other type of bread for collection from the shop on Monday, please order by 3pm in the shop on Friday. We can order bread for you on any other day if we receive your order by 3pm the day before. For those who prefer vegetarian or vegan fare, we are now stocking Clive’s Pies- handmade pies and tarts all made locally in Buckfastleigh. There are some mouthwatering flavours such as Homity Pie, Creamy Mushroom, Chestnut and Bean Cassoulet, Greek Lentil and Olive, Mexican Chilli, Tomato and Olive Provencale plus other flavours. The pies and tarts are delivered on Tuesdays and will be chilled as well as frozen. Come down and try them! We also have Quorn mince and sausages in the freezer. Aune Valley butchers supply us with a wide variety of Meat & Sausages, you can order any of their meat for collection from the shop – just ask Peta for the price list. Thinking of a Summer barbeque? We stock instant disposable barbeques, sausages, beefburgers, buns and more! Fish – we stock vacumn packed frozen fish including cod, plaice, haddock, scallops and prawns, and there is also a delicious luxury fish pie mixture, (all locally supplied by Britannia Shellfish). We can order these for you on a Tuesday to be delivered on Fridays. Please place your order in the shop. We stock Potatoes grown on a local farm by Lidstones. Kerryn of Bunns ‘n Crumbs makes us yummy Brownies, Millionaire’s Shortbread and Lemon Drizzle Cake and also beautiful special occasion cakes. The Bakehouse has now started to supply us with a large range of Cakes (Fudge Cake, Somerset Cider Fruit Cake, Chocolate Loaf Cake etc.) and Biscuits. We stock the famous Ice Cream from Salcombe Dairy. There are several local bee-keepers; Chillaton Farm and Grove Park supply us with as much honey as they can. Sandwiches are produced for us by the Fisherman’s Rest. The Chilli Farm produces Chilli Jam, Chilli Jelly and now Sweet Thai Chilli Sauce! We stock a range of delicious pick-n-mix marinated olives and garlic. JB Preserves make wonderful Marmalades and Lemon Curd. Heron Valley Organic make Apple Juice [Sharp and Sweet], Apple and Pear Juice and Cider. We have Salcombe Brewery beers including Shingle Bay and Prospect. We often also have several selected wines on Special Offer – call in and see what we have! We have a wide range of delightful Greetings Cards created by our very talented local artists – Sarah Harcus, Allan Green, Maggie Sharpe, John Ashton, Les Howard, Rococo Cards, Mackenzie Ringrose.